Clients with continually changing product lines will appreciate the training and knowledge of Future Packaging’s sales and packaging engineers personnel which will design packaging for new or current projects using the latest CAD/CAM technology. For oceans transport shipments, export crated goods are further containerized into 20 foot or 40 foot sea containers. The crated goods are ALWAYS fully blocked and braced inside the Sea Container to prevent shifting or moving while in route. Pneumatic nail and stapling guns are used to fabricate various shipping crates. Depending on the thickness of materials used, fasteners range in size from ¼ inch staples up to 5 inch nails. Various hinges, hasps and twist fasteners locks are used in building reusable “show” containers. Future Packaging Group is a full service packaging and crating company. Its focus is packing high technology equipment and heavy machinery for shipping domestically or internationally. All modes of transportation are utilized. The company brings many years of experience; dating back to 1961, a well trained staff of packaging specialists, have provided expertise in the design, testing and fabrication of various shipping containers. Future Packaging Group’s high service standard has generated a well known customer base which includes many Fortune 500 companies. They specialize in providing the superior levels of service and skill that are required by many high technology equipment manufacturers. The packaging and crating service takes place at 30,000 square foot facility which is located in San Jose, California. 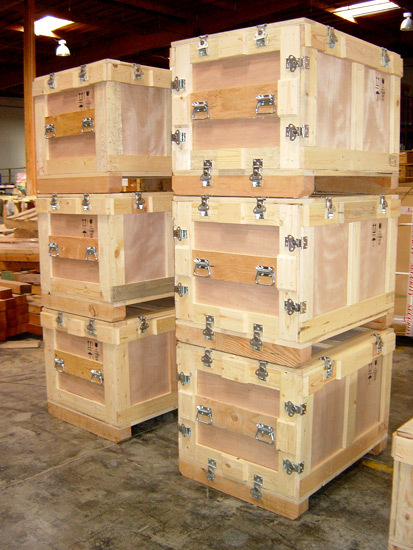 Trained packing crews are also available for clients who prefer to have the equipment crated at their facility.